You are here: Home "In the Footsteps of an Angel"
June was born on a dairy farm near Colfax, WI in 1927 and grew up during the “Great Depression” years. June was confirmed in the Colfax Lutheran Church. 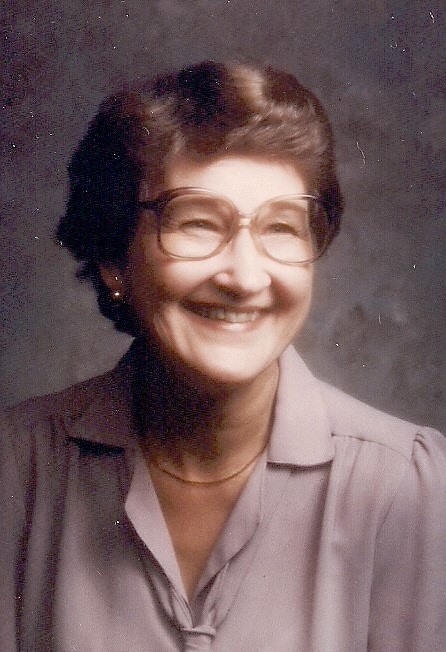 June had a lifelong faith and a love for the Lutheran church. June later became a member of the Redeemer Lutheran Church for 50 + years. In spite of her many personal church activities, June always made light of and ignored her own achievements. June’s personality never strayed far from that of the farm girl from Colfax, Wisconsin that I first met in 1951. June was totally without guile or pretense. I know of no other person in my lifetime who has or comes as close to the Bible definition of the virtue of humbleness...often described as the "greatest of all virtues and the least sought after!" Stan's Note: (January 2019) Since Stan first created this page on June's website in March 2012, over 12,600 people have visited this page. This little book (approx. 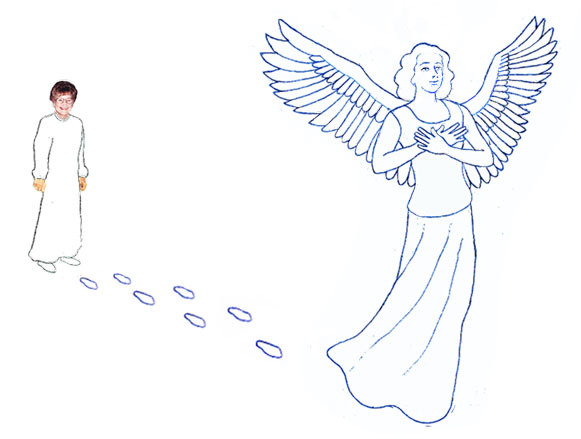 3” x 4”) is entitled “A Little Book of Angels” and is only 75 pages long and contains numerous sayings, quotes and commentaries on Angles by poets, writers and philosophers. 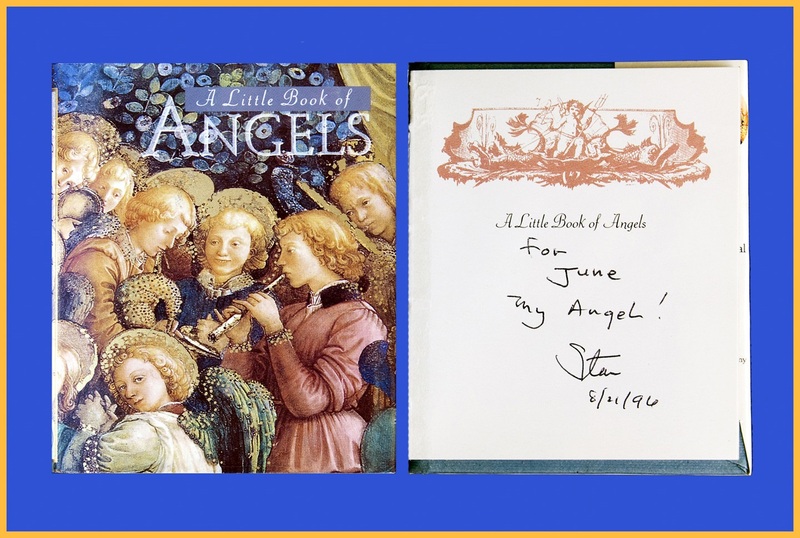 This gift to June from Stan was dated around the time of our 44th anniversary in August 1996…the inscription on the title page suggests that I thought of June as my ”Angel”. For many years June traveled with me in the US, Canada and Europe to attend forensic science conferences as a part of my forensic science career. I know that June while being perhaps a bit amused at my references to her as my Administrative Assistant, did at the same time appear pleased with this designation. In reality, what would I have been without her and the support she always gave me? London, was a city we visited 8 times and it became June’s favorite city. 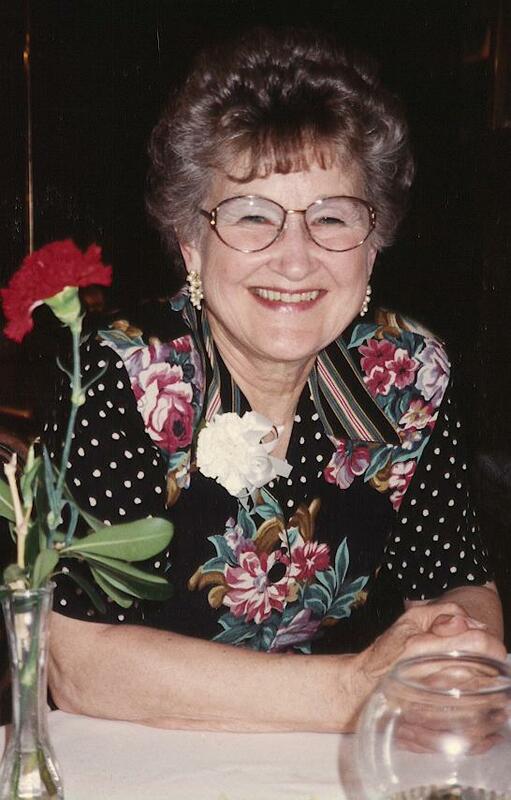 June established a life long friendship with the Bruce family of nearby Bexley, Kent. June loved to dance and we danced the night away at such exotic places as the Rossia Hotel in Moscow in 1969. This was during the first ever Soviet-American Symposium in Forensic Science and at the height of the "Cold War." June had a handshake with Pope Paul VI during an audience at the Vatican in 1973. She was a part of official receptions by Her Majesties Govt. In Edinburgh in 1972, the President of Italy at Rome in 1973 and at the House of Lords in London in 1999. June spent a week at Oxford University in 1984, residing in the student housing at the historic Christ Church College. June gave me a life time of unconditional love during our 56 year’s marriage and a life with only the regret that it is now over and that June has had to suffer the horrors of Alzheimer's. I owe her and God an unending debt! Her passing was as if a most beautiful symphony that played during our life together, had now ceased to exist! Before her Alzheimer's diagnosis our world and her character and personality were represented by a vast sea of bright and beautiful lights. After her Alzheimer's diagnosis, these bright lights all begin to slowly dim. As June slowly slipped deeper into the shadows of Alzheimer's, the lights gradually flickered out one by one. Eventually the time came during the last two years of her life, when the brightness that marked our world and June’s life was replaced by one of darkness. June rarely ever opened her eyes to a world that was then alien and strange to her. June had become so tired, exhausted and weary that in the last year of her life she lay like a wounded soldier on a battlefield. God mercifully took June home on the 23rd of October 2008. June's passing leaves me with an emptiness that can never be filled! Bernadette Brady - Dublin, Ireland - (8 November 2012): "Thinking of June on her 85th Birthday, in heaven. Thinking of you too and sending you comfort and strength." Michele Christie - North Carolina - (9 November 2012): "Remembering June." Christine Pickard - Lincoln, Lincolnshire, United Kingdom - (9 November 2012): "Wonderful ." Dianne Cogar - Springfield, Ohio - (9 November 2012): "Absolutely beautiful!! !...I hope you found some peace of mind as you sat there over dinner last night pondering some wonderful memories while celebrating Junes birthday yesterday. Though I know you felt lonely there without her by your side, I believe she joyfully shared the hour. What a beautiful gift in honoring your wife." Merideth Sindel - Sydney, Australia - (9 November 2012): "Anniversaries are not easy. When those awful 'firsts' come along you feel as though you're the only person in the world. To make this anniversary into a kind of party as well as a tribute/celebration is a big effort, Stan. June is still there for others." Linda Farr Borman - Fridley, Minnesota - (11 November 2012): "I read it in this mornings paper. Your love shines through the words you write about June. Beautiful." Timothy Hayes - Dublin, Ireland - (12 November 2012): "Very very moving Stan, beautiful foto...very well put together." John Stevens - Twin Falls, Idaho - (16 April 2014): "Beautifully done Stan." Debbie Larsen - Buffalo, Minnesota - (16 April 2014): "Thank you Stan, I took the liberty of sharing." Heather Pearson - Southampton, United Kingdom - (16 April 2014): "EXTRA! EXTRA! Friends' Newsflash: Stanton O. Berg link from a post in ' Facebook's 'Dementia Aware Closed Group'. 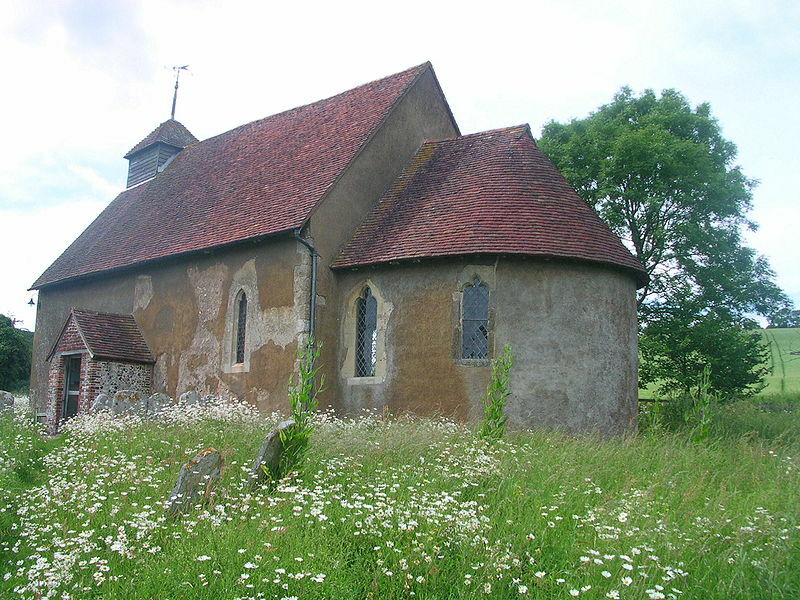 A very poignant post about Stanton's darling wife at this Eastertide."